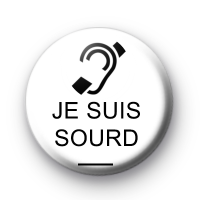 Je Suis Sourd - I am deaf badge in white with deaf aware logo. Custom black and white badge for Doug Weller for his wife who is hard of hearing & travelling to France. Custom 25mm button badge hand made in our UK workshop.